TGN’s Enrico Nardini risks the jaws of death to interview Clint MacLean, the creator of the Sharktipede, now terrorizing Kickstarter! Let's hope Enrico doesn't get eaten in the process. 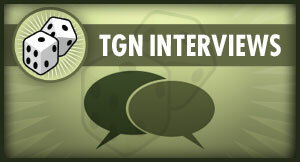 So get ready for another TGN Interview. This time it's all about Sharktipede. Enrico Nardini (EN) - The first Sharktipede Kickstarter failed to fund. The relaunch has funded and is moving into stretch goals with 21 days still left in the campaign (at the time of this interview). What did you change to make the Sharktipede more appealing? Clint MacLean (CM) - I didnt change that much about Sharkitpede. I simply updated the base he was standing on to look a bit better. The real key difference in success was pre-planning, pre-advertising, and also just reaching out to the proper demographic. The first time around I expected Kickstarter to do the work; I thought people would just donate thinking he was cool. It doesnt work that way, and I found that out the hard way. EN - The Sharktipede Kickstarter video states that these figures will be produced via a 3d printing process. Can you elaborate on that process (material used, how the pre-painted figures will be produced, etc.)? CM - The figures are going to be 3d printed in high detail by the good people at Ownage 3d printing. Once they have the master print, they will make molds and then cast copies in resin. Once all the copies have been cast, those that are going to be painted will get shipped to a painter and hand painted individually before i send them to the happy backers! Red - One of many Sharktipede colors. EN - Fulfillment is always a top issue for Kickstarter backers. What is your plan to ensure that backers get a high quality figure in a timely manner? CM - I do 3d character work for a living, so I have contacts with my printer and painter. I have made them aware of the Kickstarter. They know the orders are coming! That should help move things along. This is my first successful Kickstarter. I’m trying to be as prepared as possible. If Sharktipede gets too much bigger (and I hope it does), the only issue will be the sheer volume of printing. That could slow things down a bit, but it would be a good problem to have! EN - Your Kickstarter page cites movies such as Sharknado, Croczilla, and Deep Blue Sea as inspiration, but not Roger Corman's Sharktopus. What gives? CM - It’s funny you ask that. 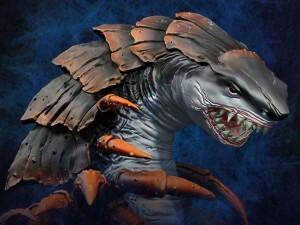 I actually hadn’t even seen trailers for Sharktopus until AFTER I started sculpting Sharktipede in Zbrush. I cant really say it inspired me. I don’t get to watch much TV these days. I watch a lot of Netflix, and I dont think Sharktopus is on there. EN - What new creatures can we expect to see from you in the future? CM - I have been working on these mash-up type monsters for a bit. I’m planning on doing more with that. I know people like sharks a lot these days. I might even do another round of shark related monsters. If people are as into them as Sharktipede 2.0 seems to show, then I’m more than happy to make them. They are a lot of fun to sculpt. You can check out Clint MacLean’s frightful fish at the Sharktipede 2.0 Kickstarter page.